Are you looking to redesign your home but don’t know where to start? One thing that is often overlooked is how easily you can redesign your staircase. If you adopt a small staircase design you can maximize the space available in your home and create a feature that will wow anyone who enters your home. It is important to consider the staircase design before you start planning your home layout; this will ensure you have the perfect design for your home. The spiral staircase is a timeless classic. It takes very little space and can be created out of wood, metal or virtually any other substance. But, when creating a spiral staircase it is important to consider the right balustrades. 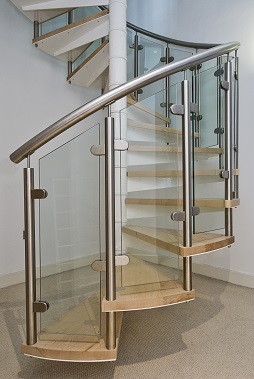 If you choose stainless steel balustrades with glass panels it will be almost invisible, helping to make a stunning staircase in any part of your home. If you have limited space then you can consider the loft ladder stairs. These are quite steep but take up virtually no room. They might not be the most stunning design but they are very practical. This is a concept that many people avoid due to fear of the glass breaking as you walk on them. If you use toughened glass designed for walking on, this will not be an issue. The beauty of a glass staircase is that even if you opt for a wide set of stairs they will look like they are barely there. Just don’t look down if you have any fear of heights! Another great option is to have a central support for all the treads and choose a steeper than normal rise. This will allow you to minimize the space required while creating a simple but stunning design. This is a great technique for a modern home but should be coupled with a good balustrade. The principle is to mount every stair into the wall. The affect should be almost like an array of book shelves climbing up your wall. This is as minimal as it gets but you do need a solid balustrade; glass is a great idea to retain the look of invisibility. Spiral staircases are fantastic but they do make it awkward to shift furniture between floors and the stairs can be narrow. Another great way of minimizing the space taken up by the stairs is to ensure they hug the wall in a corner and turn; creating a two stage climb to the next floor. In effect the stairs are almost part of the wall; you can even build an internal wall to hide them completely. But you must remember to keep the landing space small; a large landing may look great but it will shrink your home. The key to creating a stunning staircase design, even in a small space is to mix the materials. Wood, glass and metal can blend together exceptionally well.